I was surprised to learn that AMD's Torrenza technology, which connects devices directly to the Hyper Transport links of the CPU, is not limited to a few extremely high-end niche markets (like Cray Inc., the supercomputer company). Supermicro showed its H8QGL-6F+ to us. From a virtualization point of view, this is a pretty mediocre board: only 16 DIMM slots for a total of four G34 sockets, and thus a total of up 48 Opteron 6000 cores. However this board is not targeted at the huge virtualization market. 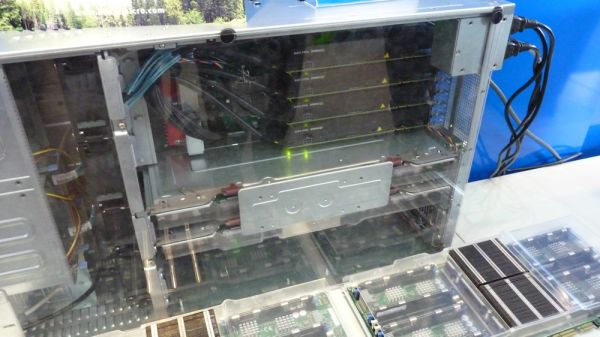 Supermicro daisychained two I/O hub togethers to get 80 PCIe lanes. As a result the board can add the crunching power of 5 GPUs to the 48 Opteron cores . The HTX slot offers a low latency 6.4 GB/s interface. Together with these kind of "NUMA connected" cards, it is easier to build a very low latency HPC cluster. However, it seems that the HTX slot is at the end of its lifetime. The upcoming Xeons seem to come with a PCI-express 3.0 controller integrated, so they should be able to offer a low latency interface of up to 12.8 GB/s, or twice as much. If that is not enough crunching power for you, Supermicro presents you the Superserver 5086B-TRF. 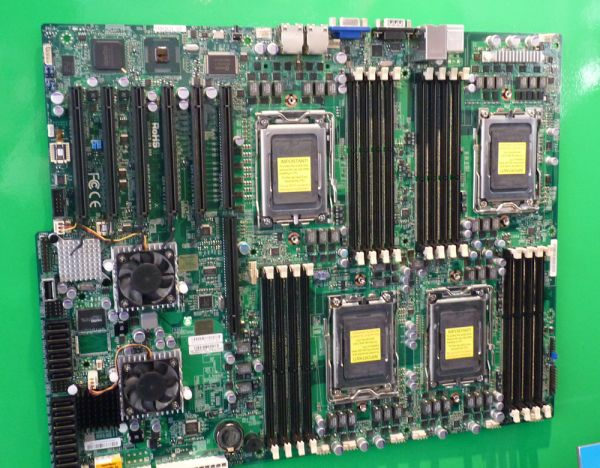 Four daughterboards can each carry two 10-core Westmere-EX. That is good for 80 cores, 160 logical CPUs. Those who have been looking through the new specifications of the VMware vsphere 4.1 update 1 might have noticed that the maximum amount of logical CPUs has been increased from 128 (vSphere 4.1) to 160. No coïncidence if you ask us. There are 10 PCIe 2.0 slots available, which should make it possible to add 4 GPUs. The maximum amount of memory is an impressive 2 TB (!! ), if you equip the server with 64 mega expensive 32 GB DIMMs. At the moment, the server supports only 16 GB DIMMs, so you are "limited" to 1 TB. This beast is powered by 2+2 Gold Level 2800W power supplies. the next problem is normally not enough Real Memory. You spent only a few hours at the largest IT fair there is and come to the conclusion its becoming less international every year just because the few booths you visited mostly presented you with german material? "The HTX slot offers a low latency 6.4 GB/s interface. Together with these kind of "NUMA connected" cards, it is easier to build a very low latency HPC cluster. However, it seems that the HTX slot is at the end of its lifetime. The upcoming Xeons seem to come with a PCI-express 3.0 controller integrated, so they should be able to offer a low latency interface of up to 12.8 GB/s, or twice as much." Plus a lower latency on top of it.